Autumn is here! Squeee! Ever since I started getting seasonal allergies in the spring, fall took over as my favorite season. The leaves turn such beautiful colors and it's not too hot nor too cold (though that perfect in-betweeny time is quite short in New York City). I only wish I could head back up to the Catskills during Columbus Day weekend for another fall getaway because even though I was DYING with the flu, it was an amazing time. I celebrated the first day of fall yesterday with the Etsy NY Team at the Montague St. Summer Space festival in Brooklyn Heights and had a good time showing little kids how to make their own tiny books. It was a gorgeous and clear day, but the wind kept blowing our paper scraps all over the place. All I wanted was a thicker sweater and a cup of mocha to keep up with the stream of kids. Now that the new season is here, I can't wait for pancakes flavored with pumpkin pie spice and cinnamon, coconut oil massages by candlelight, and finally busting out my cozy throws, tights and brown leather boots again. As much as I love summer as well, the hot flashes brought on by the tamoxifen made it so unbearable for me at times. Hopefully the cooler weather will even me out. What are you looking forward to in the cooler months? 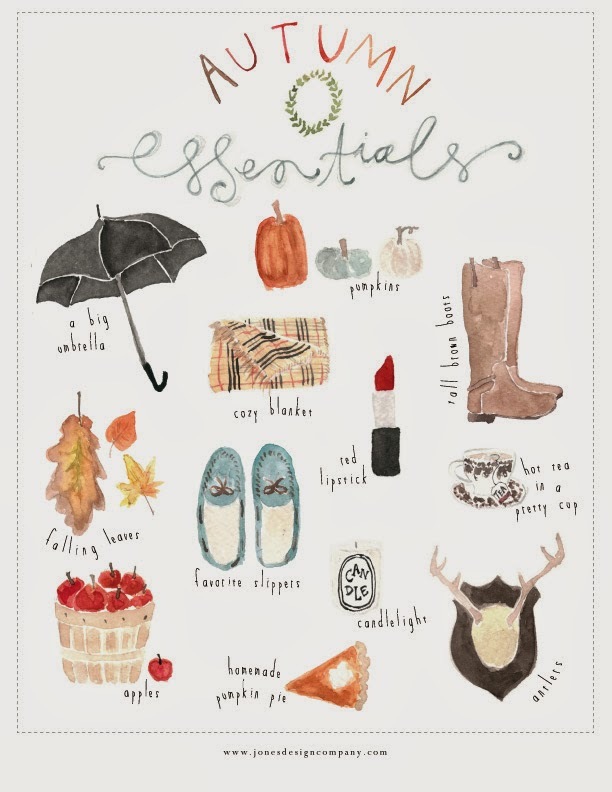 To decorate for the season, download this pretty Autumn Essentials watercolor print from the Jones Design Company. Summer fans who still want to cling to summer days, can print this one instead. Such a pretty watercolor print. Thanks for sharing! We went apple picking this weekend and that was a lot of fun for the kids. I am looking forward in taking them to a pumpkin patch and carve/decorate a pumpkin together. Then we have our Disney vacation in October, too. I love that you guys have maintained that tradition all these years. I'm sure now with the kids it's like visiting for the first time all over again. Pancakes flavored with pumpkin pie spice? Mmm... that sounds good! Oh man it is SO good! A. and I had it at the bed and breakfast we stayed in the Catskills and those were probably the best pancakes I'd ever had. I had to know the secret!